And here we have another teeny tiny inchies book! I bound them together at the top this time, so it's like a little page-a-day type calendar thingie and you can pick which inchie you want showing depending on how you feel. If I still had a desk job, I'd want to make several of these to correspond with the month and day that you could flip to change every day. Maybe I'll just make one for the heck of it. Is it just me, or does this picture make it look bigger than 1''x1''? Mehhhh. Man, I'm still in kind of a creativity slump! And it's really chapping my caboose. Seems like the only thing I can concentrate on lately is inchies, and I feel like I should just give in and make millions of inchies. Anyways, have a fantastic weekend, everyone! Someone just asked me how I would display inchies. This is a great idea. They look so cute and yes, they look bigger. These books are darlings! !How wonderful.I love your work!! Hi Karen, thanks for all the sweet compliments!!! The jump rings I use are just ones from the jewelry section. I'm not sure of the exact size, I just eyeball em at the store and think, "hmm, that looks big enough!" Sorry to hear you're feeling not too great. Get well soon! Hi there! So happy to find your delightful blog! I LOVE this little inchie book! It's so great!!! Will be back soon to see what's new. Glad to hear you found your birdie again! Your Inchie Books are absolutely delightful! They make me smile. You are a clever young lady. 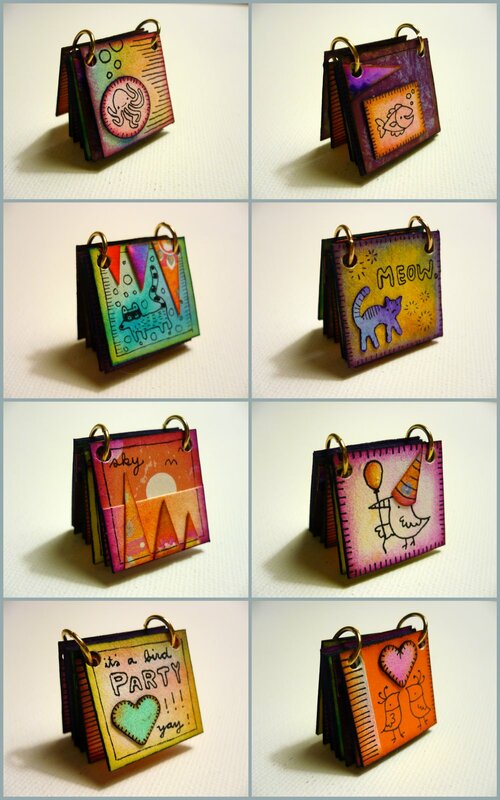 Absolutely amazing mini books!!! They make mie smile! :-) Cool project!!! Have a wonderful day!!! OMG! I found a pin of one of your inchie books and absolutely loved it! I followed the pin to your site and rolled with laughter when I saw your site name! YOU are so talented, not to mention hysterically funny! I became a follower today. Thank you for the laughter!